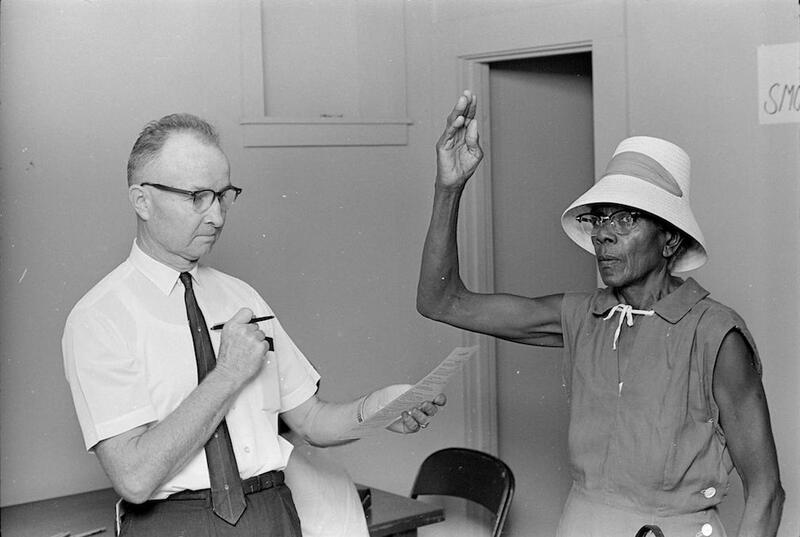 Mississippi was the focus of intense efforts by civil rights activists to register African American voters in the early 1960s, mostly notably during the violence-filled Freedom Summer of 1964. Despite the work of the Student Nonviolent Coordinating Committee and the Mississippi Freedom Democratic Party, however, fewer than 7 percent of the state’s eligible blacks were registered by 1965. Federal intervention to address the problem finally came with the passage of the Voting Rights Act of 1965, which suspended the various disfranchisement clauses passed by the state legislature or contained in the 1890 Mississippi Constitution. Federal registrars arrived in Mississippi just days after the passage of the act and began registering voters. Not all counties received registrars immediately, mainly because the US Justice Department preferred to obtain voluntary compliance from local authorities where it could. Sunflower County, home of Sen. James O. Eastland, did not see registrars until almost a year after the measure’s enactment, a delay that indicated how much influence Eastland wielded with the federal government. By 1967 59 percent of Mississippi’s eligible African American voters had registered, a massive increase that still left the state with the lowest rate in the South. The first tangible yields came in the 1967 statewide elections, which saw the victories of twenty-two black candidates for county and local offices, including Robert Clark, who won a seat in the state legislature from Holmes County. All of the victories came in black-majority counties, however, and many more black challengers were defeated. The state’s leading black politician in the late 1960s and early 1970s was Charles Evers, brother of slain civil rights leader Medgar Evers and state field secretary for the National Association for the Advancement of Colored People. Evers and his allies conducted voter registration drives in southwestern Mississippi, and he won election as mayor of Fayette in 1969. In 1971 he ran as an independent candidate for governor but was defeated by Democrat William Waller. During this period most black independent candidates, with the exception of those in such Mississippi Freedom Democratic Party strongholds as Holmes County, were defeated, and most successful candidates won nomination as Democrats. The state party, known as the Regulars, dominated the state offices and party leadership, while the mostly black Loyalists won recognition from the national Democratic Party in 1968 and held the national convention seats. Black political power continued to grow, with 68 percent registration (more than three hundred thousand voters) by 1971. African American candidates began to win control of small municipal governments in the Delta and to take seats in county governments. White incumbents who had opposed the civil rights movement quickly discovered that they could keep their seats by making concessions to African American voters, a practice that split the black vote in many elections and preserved white political power in some black-majority towns and counties. In the 1970s and 1980s black plaintiffs brought a series of lawsuits challenging vote dilution on the state and local levels. At-large election systems in municipalities kept city councils all white, county gerrymandering prevented or reduced the number of African American county supervisors, and multimember legislative districts prevented the election of additional black state legislators. Federal court rulings, including several by the US Supreme Court, dismantled some of these barriers in the 1970s, and the extension and strengthening of the Voting Rights Act in 1982 effectively eliminated the last of them. These events, combined with Gov. Cliff Finch’s 1976 integration of the Democratic Party’s Regular and Loyalist wings under a power-sharing scheme, created a significant black political presence in the state. In 1979, seventeen African American candidates won election to the Mississippi legislature, including two members of the State Senate. African American legislators showed their strength in such issues as the passage of the Education Reform Act of 1982, which was pushed through by Clark and supported by every black legislator. Black political power was not absolute, and white Democrats imposed clear limits to keep white voters from switching to the Republican Party. Gov. William Winter created a political controversy in 1980 when he ended the arrangement to have black and white cochairs of the Democratic Party and instead installed a single white party head. The Jackson city government resisted ward elections until 1985, an action that kept the government completely white even though more than 40 percent of the city’s residents were African American. The last major voting rights barrier was the integration of the state’s congressional delegation. In the redistricting following the 1980 census, the 2nd District had a slight majority of black residents. Clark won the Democratic nomination for the seat in 1982 but lost to a white Republican, Webb Franklin, in a race marked by coded racial appeals by Franklin’s campaign and a lack of enthusiasm from white Democrats for Clark. After the 1982 race, the federal courts, citing the renewed Voting Rights Act, redrew the district to increase the African American population, but Clark lost again in 1984. Not until 1986 did Clarksdale attorney Mike Espy become the first state’s first African American member of Congress in the twentieth century, defeating Franklin. In 1993 Espy became Pres. Bill Clinton’s secretary of agriculture, and Bennie Thompson, a black Hinds County supervisor, won the seat. With the political realignment of the white electorate to the Republicans, the Democratic Party has become more dependent then ever on black voters, but the reluctance of white voters to vote for African American candidates means that Mississippi still has yet to elect a black candidate to a statewide office. In a 2013 case, Shelby County, Alabama, v. Holder, the US Supreme Court invalidated the section of the Voting Rights Act that required preclearance from the US attorney general or a three-judge panel of the US District Court for the District of Columbia for institution of new voting practices in Mississippi and other areas with histories of voter discrimination. As a result, beginning with the June 3, 2014, primary election, all Mississippians were required to show a photo ID card before voting.